Winner of the Lanson Award for his wine travel broadcasts on BBC radio, Hamish Marett-Crosby takes a wine and food lovers’ journey around some of the great, and lesser known, wine areas of Europe. What more natural place to start than France, where Hamish will take you through Burgundy, the Rhône, the Loire and beyond. For each of the regions Hamish will evoke the best of wine, food, culture and scenery. 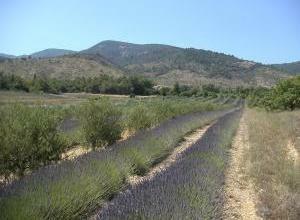 In this installment, he continues his journey south from the Ardeche, visiting Avignon and the Rhône valley. Click on any point in the map to read Hamish’s report on that region. Using Avignon as a base away from your normal round is not a late twentieth century fashion. The Romans did it in very large numbers, and the fourteenth century Papacy moved there, making the city one of the power-broking centres of the late middle ages. Of course, hordes of Parisians, then English, Dutch and Germans have been coming to Avignon for the past 100 or so years. And why not? It is a nice place to be. 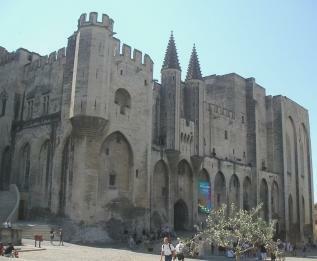 Moreover, any region which was once was the economic and social centre of Gaul, and one of the cultural centres of Christendom, must be of interest to anyone with even a passing interest in the historical evolution which brought us to where we are today.Avignon is easy to get to from the UK. It may be long drive, but British Airways flies to not-so-far away Lyons on a regular basis, budget airline Ryan Air flies to Nîmes about an hour south by car, and now the wonders of Eurostar will hurl you direct from London to Avignon in around six hours. Using the city as a base you can explore the region and prove the effectiveness of that simplest of tourist rules – any name which is familiar from a wine list can’t be too bad a place to visit. After all, if the worst comes to the worst, at least you will get something decent to drink with your evening meal. Those who have driven south will arrive at Avignon bemoaning the loss of expensive fillings and still trying to prise what appears to be quick-set crack filler out of their teeth following a brief stop at Montelimar, the home of nougat. To the East the mountains can be seen as a hazy backdrop to a fertile region that is green in the way that only Southern Europe is green, and dry such in such a way that says “yes, the South starts here”. The villages that make up this fertile plain testify by their names that here you can get a good everyday bottle of wine or, if you are lucky, a relatively unknown “find” for special occasions or with which to impress and bore your friends on your return. This is the area of the Côtes du Rhône Villages and the great wine making villages which include Châteauneuf-du-Pape, Gigondas and that commune which, a generation ago, lead the revolution in English wine drinking trends, Beaumes-de-Venise. Relatively inexpensive examples of the latter made sweet wine a fashion accessory at the end of a meal that anyone could afford. The Roman presence is testified by the aqueduct across the river at the Pont du Gard, the impressive remains at Orange with its theatre and the triumphal arch, as well as the quieter and more peaceful excursion to Vaison-La-Romaine to the eastern side of the valley. Indeed the contrast between Orange – where you can either be killed crossing the roads, or die of old age waiting for a gap in the traffic – and Vaison La Romaine, symbolises the contrast between the bustling commercial cities and the rest of the region. 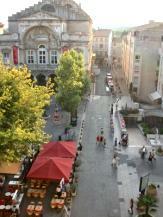 How can one describe the busy square and boulevard outside the Palais des Papes in Avignon? The Palais contains a room reserved for tasting a grand selection of wines from the region, and offers a mediaeval respite from the world that gathers in the square and cafés outside. The world is divided into two categories of people: those who like street entertainment and those who don’t, trying to relax whilst doing their utmost to avoid eye-contact with the performers.The bridge at Avignon, known to all through the song, is a disappointment for it is undistinguished and only stretches half way across the river. Nevertheless it is used – it seems – by all newly married couples as the place to take that posed wedding photograph – a practice that has led some to comment the Pont d’Avignon is the bride’s second biggest let-down of the day. Near Avignon the valley of the Fontaine de Vaucluse retains a memory of the atmosphere – despite the crowds and some of the more crass commercialism – that is said to have inspired the great early renaissance humanist and poet, Petrarch. Here the river springs fully formed out of the mountainside, and the lush valley is filled – if one exercises a little imagination – solely with the sound of water. In Petrarch’s time it must have acted as a welcome contrast to the bustle and court intrigues of the Avignon Papacy. But that’s the great joy of traveling to classic wine regions; there are so many echoes of the past. As with Verona and Dante’s love for Beatrice, here near Avignon, Petrarch could sit and dream of Laura, who became the inspiration for his poetry and a life long passion that has become a by-word for constancy and purity. Bounded by the great escarpment hanging like a giant lace curtain in the heat – Les Dentelle de Montmirail – to the east, and the river Rhône to the west, the region to explore is, as wine regions go, small and reasonably self contained. Apart from the famous villages of Châteauneuf-du-Pape (one of the most abused names of the UK wine trade for a time), Gigondas and Vacqueyras, there are the other Côtes du Rhône Villages, the appellation for wines with a higher minimum alcohol content than basic Côtes du Rhône. Côtes du Rhône Village covers 16 villages in the southern Rhône that have traditionally made superior wine. Wines from here are now being imported under their village names as each village vies for their share of the ever-expanding wine market. Now is the time to decide which one you will be savouring in years to come: Cairanne, Séguret, Valréas, Sablet, Visan, Chusclan, Laudun and the rest. Soon we will be as familiar with the village wines from this area as we are with the villages of the Beaujolais Villages appellation, like Morgon, Julienas or St Amour. But apart for wine, this fertile region produces lavender, fruit, truffles (white truffles here not the black ones of the Perigord) and olives. Those of us – and we are many – who find a plate of olives impossible to pass without picking, should make a pilgrimage to the market at the small town of Nyons to the north. Here is olive sampler heaven, for Nyons is a centre of the olive oil industry. On market day the square and the nearby streets are lined with sacks of olives, stalls of olives, olive oil, stuffed olives, preserved olives, olives till they are coming out of your ears. Before you go, a reasonably hair-raising drive up one side and down the other of Mont Ventoux gives you spectacular views in which to embalm your memories of a very special region. Added to that is the immense pleasure that can be taken from reflecting on the fact that you are not one of the bicyclists who frequently race up and then down the mountain; there are some pleasures reserved for a favoured few, and in this region of France there are plenty of other ways to enjoy yourself.